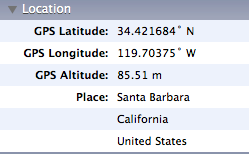 Geotagging is not the prettiest word, but it's a fun part of photography that many people still aren't enjoying. In this podcast, I introduce you to easy (and affordable) ways to get your feet on the ground, so you can add this new dimension to your pictures. Street Shot is the February 2009 Photo Assignment. Time to hit the pavement and discover the interesting moments of life that happen all around you. You can read more about how to submit on our Submissions page. Deadline for entry is Feb. 28, 2009. I just listened to your latest Podcast about Geotagging. All of the current crop of solutions seem too expensive and too much work. I'll wait until it's built-in. Maybe my next DSLR will have this feature. One solution to the cost (it's still more work) is to use the builtin tagging feature on Flickr. It's free! If you go to the Organize screen you can pop over to a map and tag all of your photos. We vacationed on Martha's Vineyard last summer and it was a lot of fun to explore the map and see who else had taken picture in the same places I did. Thanks for the Great Podcast. I tried TWIP and they are just too stuck on themselves and too fanboyish for me. I appreciate how you view your gear as just tools. I think it's a trap we men fall into all too easily - we try to generate our self worth from the tools we choose. Hi Peter, thanks for your comment. We're definitely at the early stages of geotagging. And it does add an extra step to just about any workflow. I've enjoyed employing it for certain situations, however, such as when I'm on the road. It's like a lot of other things in photography: choose the tools that make sense for the situation you're in. I'll definitely keep reporting on the evolution of these tools. I'm sure they'll get to a point we all like before too long. Remember how hard Raw processing once was? Anyway, here's something I noticed when doing Place tagging in iPhoto. Many cellphones embed location into your photos. So if you don't have a GPS enabled camera then just take a location-reference photo with your cellphone and use that location on the photos when you start tagging at home. Hi Urkel, Actually I think you make a very good point. When my video training is released (soon) on Places in iPhoto '09, you'll be happy to see that I address this issue. You can geotag images for general locations, such as the city they were captured. That way, people still can know the general location (County, State, City) without privacy being compromised. If you want more accurate tagging, such as the street address, you can do that too. I agree its early days for Geotagging but it is getting better. For examle you can use your iPhone, with an application called IMarkMySpot, to record locations as you shoot, then email a waypoint file to yourself. Lightroom users can use a GPS Support plugin from Jeffrey Friedl to match the waypoints to the images you have already downloaded into Lightroom. Not quite seamless but pretty close! It can knock down your offline selling tolls too if you get it ended the right way. Watching someone who not only does SEO but does the content initiation and distribution for you as well as keyword research, updating content on your website and blog, having professionaly written releases at under costs as mentioned previous is what suits many small job owners and yet there are numerous who effort to do it themselves, they get vexed as they dont have the knowledge or the technical sciences to do it speedily and they give way. Thank you for this article! I've just acquired a surely incredible news portal about best marketing Taste it!